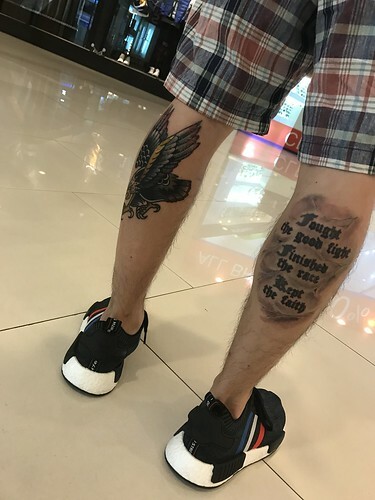 I chanced upon Stay Cold Tattoo just by randomly scrolling through Instagram and going through a few of their photos. Well, to be specific, I first saw xmissinkx‘s creations and absolutely fell in love with her style and creativity. I dropped her a private message but was directed to email the shop instead, which I did and got a response from Pear, whom I assume is their manager. Fixed an appointment and headed down to the shop located along Ekkamai Road, near the entrance of Soi 28. The pin on Google Maps is quite accurate and specific. Entered the shop and found xmissinkx already prepared with the stencils of what I wanted. I waited while she got her tools ready and off we went. I was stuck lying face down for 3 hours straight. The pain was still tolerable when she was just doing the outlines, but after the first 2 hours and when she started doing the shading and colours, probably because of the different needles used, the pain was unbearable but xmissinkx assured me that it was almost done. I guess I could probably say that the pain was worth it because I loved the outcome and it was exactly how I wanted it. They charge by the hour, so for this piece, I was supposed to pay for 3 hours which amounted to 9000baht, but being the friendly and generous people that they are, I was charged only 8000baht. I had a chat with Bigg Matt while allowing the numbing cream to take effect, and somehow ended up booking for a session with him. My existing tattoo is almost 10 years old and I guess I could have some touch ups done. 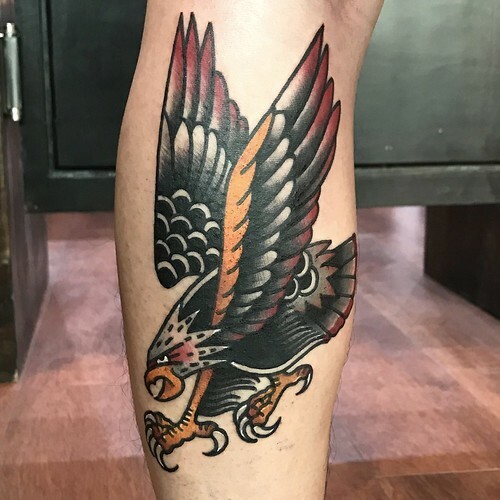 I came back 3 days later and Bigg Matt took a look at my existing tattoo and made some recommendations. I was quite open to suggestions so he introduced some white and red highlights to add on the black shading. He did mention that the current tattoo already has some very nice shading done and he does not want to overrun it. Nonetheless, I let him run his expertise and an hour later, we were done. I now have 2 painful legs. Often overlooked, the pain of the tattoo session is just the beginning. The most important part is actually the healing process because the skin needs to repair itself. I highly recommend these cream and lotion that I personally used. Nothing is to be applied on the first 3 days post-tattoo because you don’t want any allergic or chemical reactions to the tattoo ink. Moreover, your skin will still continue to bleed and reject the ink from your pores. This is completely normal. However, from the third day onwards, I applied a very thin layer of Bepanthen First Aid. It helped to soothe the pain and speed up the healing process, and then from the fourth to the fifth day, the skin will start to peel and flake. That is when I recommend applying Cetaphil DailyAdvance Ultra Hydrating Lotion. 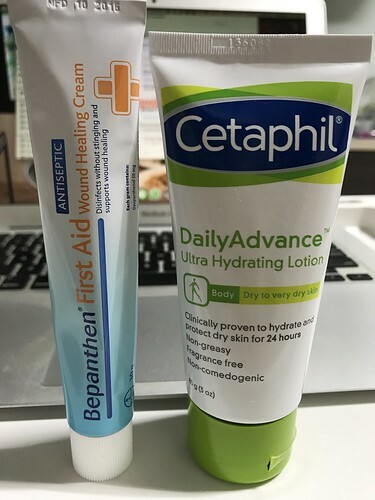 I actually found this lotion online but didn’t really manage to get it until a couple of days later, so I was using another moisturizing lotion for the first few days and I can tell you there is really a difference between cheap and expensive lotion. Cetaphil costs close to $25 for a small tube of 100ml but it works wonders.